The club were very sad to hear today of the passing of former player Angus Evans. Angus played a handful of games in the 50’s for the first XV but has been associated with our club for very many years since as a member of the former players association and also club dentist for many years. He played many games for the ‘United’ side and was understudy to Bryn Meredith and Lyn Davies. 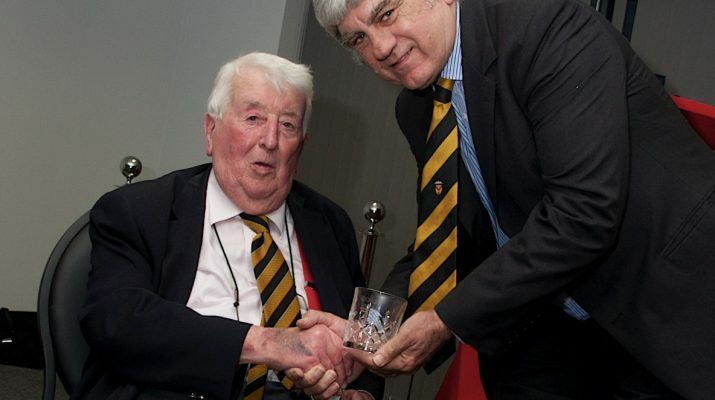 Angus was a very regular supporter of Newport RFC until recently and was also honoured to collect the Hall of Fame award for his great friend Doug Ackerman last year. Angus was also a vice-president of Crawshay’s RFC and very proud of his association with them. The condolences of everyone at Newport RFC go to the family and friends of Angus. We have lost a true ‘Black & Amber’ and a real rugby gentleman.